John O’Neill was the second son of John and Rose O’Neill. He was born on 16th February 1897 in Stewartstown. 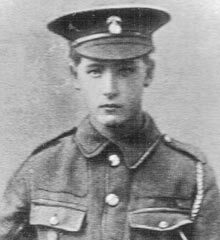 He was the second of thirteen known children, twelve surviving. His father was a servant and labourer. John O’Neill worked as a farm labourer John disappeared one weekend early in 1915 and enlisted. 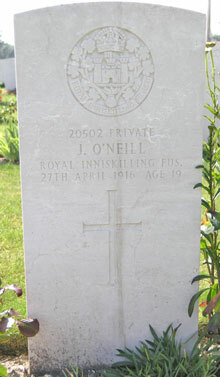 Private John O’Neill was serving with the 7th Battalion of the Royal Inniskilling Fusiliers when he was killed in action on Thursday 27th April 1916.